Are you trying to find a way to update ugly or worn out furniture in your truck camper? 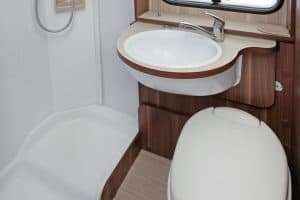 A great way to spruce up your RV’s interior décor is by using a washable slipcover that will keep the furniture fresh both in terms of aesthetics and feel. 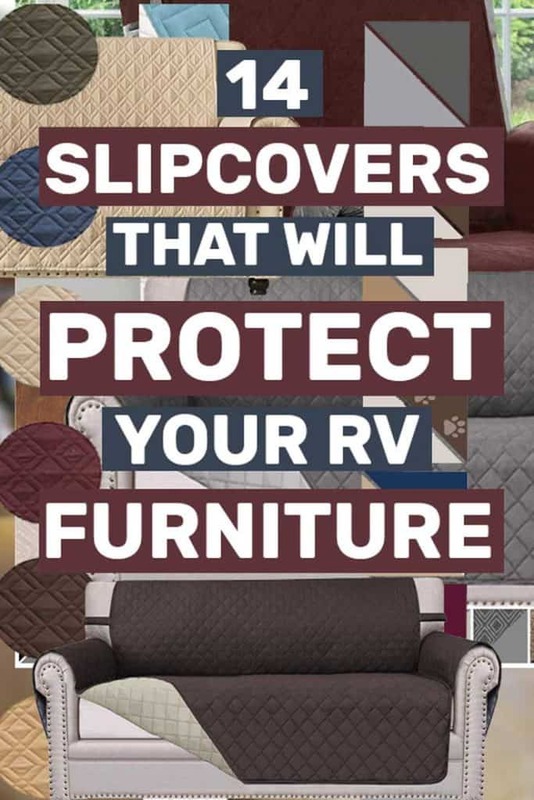 Protect your favorite couch from pets, youngsters, and the rare (but inevitable) spill with these 15 RV furniture covers. The slipcovers in this list are all durable, stylish and travel well too. So let’s take a look! If ease of use concerns you, then these sofa slipcovers by Easy-Going are definitely what the doctor ordered. With arm covers that are longer than their competitor’s, these slipcovers feature a seam at the bottom which ensures that the arm covers stay put. We were definitely impressed by the convenience of simply taking these covers right out of the package and placing them on the couch. The thin, quilted fabric fits your couch like a glove. If you expect good results, you can’t go wrong with these slipcovers. The furniture slipcovers by Gorilla Grip are known to be the best in the business. Featuring all the necessary attributes needed for easy installation, including attractive colors, durable material, thick hooks that go all the way at the back of the sofa, and being machine washable. The sofa covers have a suede-like feel to them, although they are made with PVC backing. Perhaps more importantly, these slipcovers are available with a 10-year warranty. This attests to the phenomenal durability of the furniture covers. Just make sure to treat them with cleaners, additives, and conditioners. Click here to buy this furniture slipcover. If you want an easy solution to giving a complete makeover to your sofa cover, no questions asked, then you can’t go wrong with these sofa covers. They are available in eight different colors including brown, black, blue, and green. The slipcovers are ideal for different types of sofa, especially the ones in your RV. It is extremely important to measure the dimensions of your sofa before ordering them otherwise you could run into some installation issues. These slipcovers feature all the bells and whistles including resistance from dirt and dust. They can be machine-washed without damaging the fabric or fading out the colors. We were, however, disappointed to find out that these slipcovers were not water resistant. This means accidental spillages can still wreak havoc without you finding out until it’s too late. But if you can get past all that, then this slipcover is perfect. Click here to buy this sofa cover. There are several ways to spruce up your interior décor, but by far the most effective of them is to use these sofa covers by MIGHTY MONKEY. They feature in seven different dual colors, with each side with a different color. This allows you to reverse the slipcover installation to give your sofa a completely new look. Word of caution, this sofa cover is not water resistant, and any spillage will seep into the sofa. So make sure to remove any spills immediately. Made with extremely comfortable soft microfibers, these sofa covers by H.VERSAILTEX will last you a lifetime while still maintaining their plush look and feel. The fabric is designed to mimic faux suede and is designed using environmentally friendly materials. This makes them completely safe for both kids and pets. The natural dye on the fabric ensures that the color would not fade after heavy use. One great feature that is definitely going to be very useful is that it is water resistant. You no longer have to furniture spillages. Maintenance couldn’t be easier with these furniture covers which are completely machine-washable. Just make sure to only use cold water on a gentle cycle. No bleach. This is the second product by Easy-Going to feature on our list, and for good reason. This anti-slip sofa cover is one of the most feature-rich products we could find on the market. It has elastic straps that prevent the seams from sliding, longer flaps to ensure they remain in place, and anti-slip foams on either side to prevent the cover from slipping out of space. The furniture cover is available in a whopping 17 different colors, with two color options. So if you get bored of one side, simply turn the cover ‘inside out’ to completely overhaul your RV’s interior look. The material is extremely comfortable due to its quilted texture and soft microfibers. This sofa cover is available in mesmerizing patchwork colors that will look eclectic in any RV setting. The artist manages to capture a very ‘retro’ look. So if you’re going for a more vintage look, this sofa should definitely be high on your list. It can protect your prized sofa from stains, dirt, and the usual wear and tear. 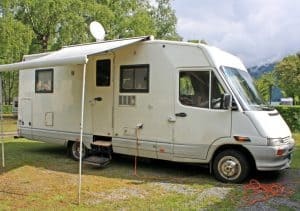 If you have a pet in your RV or want to bring the kids along for the ride, you can let them play around without worrying about damaging your expensive sofa. The fabric itself is 100% microfiber polyester that incorporates both comfort and aesthetics. Click here to buy this furniture cover. This sofa cover features eclectic geometric patterns that uniformly repeat throughout. Both sides of the sofa cover are available in different color prints, allowing you to refresh your RV’s look by flipping the sofa cover on its side. The sofa cover is available in five different sizes, each designed to cover most dimensions. So make sure to measure your furniture’s dimensions before ordering. Since the furniture cover is fully water resistant, you won’t have to worry about spillages any time soon. Another sofa cover that helps you overhaul your RV’s interior décor without ever breaking the bank. The sofa cover is available in three different colors, with either side featuring a fresh new look that will prevent your furniture from looking decadent and old. For easier installation, this sofa cover also comes with two sandbag-type pockets that help secure it onto the sofa. Maintenance is generally easy since you can machine wash the sofa cover with cold water under gentle settings and no bleach. Some sofa covers are really not built for leather and even the manufacturer warns against pairing them up with your leather furniture. So if you have a leather sofa and are in the market for some new skins for it, then this sofa cover is just what you need. It is designed specifically to protect leather sofa covers. The best part is that it is 100% waterproof, after being crafted from unique fabric that resists wear and tear. This sofa cover is available in seven different designs with each side featuring a new look. The furniture cover is built with durability and longevity in mind. Routine maintenance is easy to perform, just the cover in the washing machine and call it a day! The sofa cover easily slips on your RV furniture with minimal effort, just make sure to order after properly measuring your sofa. This product is covered with a whopping 10-year warranty, so if anything untoward happens to the sofa cover, you know just who to call. This sofa cover is 100% waterproof, which is very clear when you first open up the Amazon link. The manufacturer is banking purely on this product’s ability to resist water. With its quilted look, it’s also visually-appealing though, so definitely a great option if RV interior design is important for you. Available in four classic shades, you can literally fit in this slipcover with any RV. Love interior design? Need inspiration with decorating the inside of your RV? Check out our post with some amazing RV interior design ideas. This sofa cover is easy to install, comfortable, durable, and built with longevity in mind. These are the perfect sofa covers on the market right now. There are 14 different color options, allowing you to decorate your RV just the way you want to. Perhaps more importantly, these sofa covers are ‘engineered’ to fit your sofa like a glove thanks to their 2” thick straps that are adjustable and highly durable. Just make sure to measure your sofa’s dimensions before ordering these. Click here to learn more about this sofa cover. That’s literally the name they gave to their furniture cover. Yes, it is so durable that it will withstand all the rough wear and tear that your kid and pet can throw at them. This furniture cover is not intended for use with leather furniture but then again, most RV have fabric-upholstered couches and armchairs. The manufacturer guaranteed that once you’ve installed the cover over your sofa, it will stay put. Which is extra important when on the road. Click here to buy this sofa cover from Amazon. 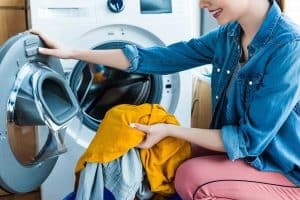 RV Laundry Solutions: Which Would Work Best for You?